Once upon a time in the Seventies, women were not afraid to be audacious or unique, either in their choice of perfume or their personalities. “Not for unassuming women”, read the copy for Yves Saint Laurent’s ‘Rive Gauche’, and if any perfumey slogan sums up an era, that would be it, equally applicable to Rive Gauche, Chanel no. 19, the teen-market version Revlon’s ‘Charlie!’ or any number of chypre/green/assertive scents of the time. And so I have, no longer anywhere near the 6- through 16-year-old I was in that decade, but one thing has stayed with me always – my penchant for the Green Fiends – scents that wave their galbanum flags loud and proud, scents with serious intentions for women you don’t mess around with. Along the way, I found it was a perpetual quest to locate the ultimate Green Fiend. Chanel no.19, a perennial favorite, is very ladylike in its assertiveness, the kind to rap you lightly with a Japanese fan if you ever go too far. ‘Knowing’ by Estée Lauder is a rosy-green chypre that is as bracing as it is bitter, and this lady is not afraid to use her very expensive handbag, should you overstep your bounds, nor timid in the least to admit her relationship with her siblings, Lauder’s ‘Aliage’, Clinique’s ‘Aromatics Elixir’ or Prescriptives’ ‘Calyx’, none of them in the slightest unassuming, and all of them carrying metaphorical Hermès Kelly handbags with some serious punch behind them, or else some serious books inside them. 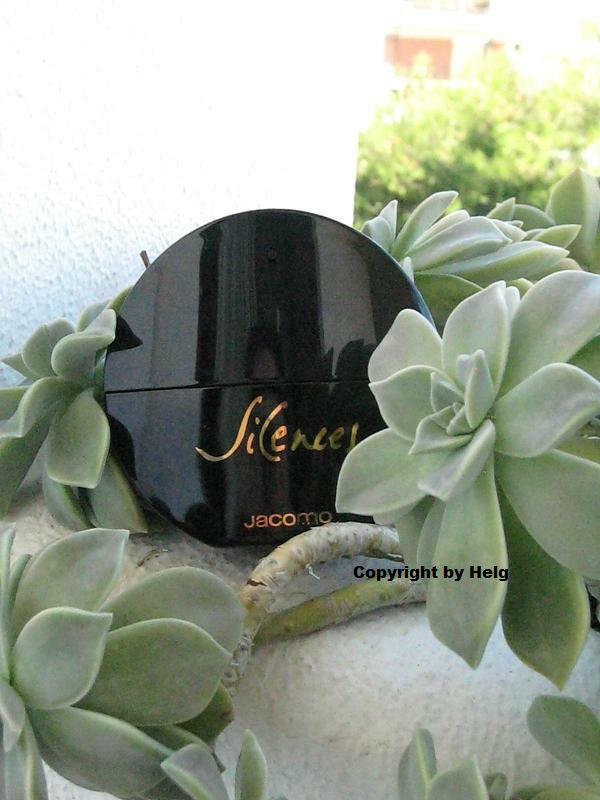 So on a whim, I wished for a bottle of a Green Fiend I had somehow managed to miss in my quest for green with a capital G.
Creeping in on sinuous, snaky tendrils of emerald green, Jacomo’s Silences arrived. Right away, I could tell this was no unassuming woman, this was a quietly commanding Helmut Newton glamazon, standing tall and proud in her six-inch spikes, not shouting her presence so much as insinuating herself into yours. You can tell she is a blood relative of Chanel no. 19, the family likeness is right on her face, but whereas Mademoiselle Chanel is intimidating, Silences is intimate and more muted and by far more…green. This is the green of deep, uncharted forest, where unexpected flowers bloom. After that sharp, bracing burst of galbanum, almost bitter, almost resinous, a hyacinth begins to bloom and grow, gathering more flowers in its wake, a hint of rose, a whisper of narcissus, the slightest touch of lily of the valley that keeps the hyacinth in check, keeping it from becoming too heady, too much, always erring on the side of class and elegance, always cool but never cold. Those flowers stay with you a long, long time before they fade away to a verdant whisper of woods, a touch of amber, a tinge of something akin to regret. It lasted at least six hours on me, and was never less than stunning. If Silences were a Tarot card, she would be the Major Arcana card called The Priestess, for that slightly chilly self-sufficient air she wears, that intimation she knows infinitely more than you could ever think to ask. She keeps her distance, and the distance only intrigues you more and lures you further in to those secret, green depths. She carries a touch of melancholy about her, a slightly pensive, eerie air, and even so, she inspires devotion, love and acolytes. I’ve worn this during a heat wave this past summer, and it was the olfactory equivalent of air conditioning, keeping me cool, calm, collected and above all – grounded in the heat. But even in this wet and far cooler autumn, she reminds me that all things return, that even Spring will return, and so will I, longing for the secrets hidden in that emerald-green shade that is ‘Silences’. This should receive far more attention than it does, but some of us do what we can to spread the word. Top Notes: Galbanum, Green Note, Bergamot, Lemon, Orange Blossom . Middle Notes: Orris, Rose, Muguet, Hyacinth, Jasmin. Base Notes: Moss, Cedarwood, Sandal, Musk .